Look! It’s Sheila and Logan from Vancouver Island, which can only mean one thing: they’ve flown into Vancouver for their annual weekend anniversary blow-out. Plus, this year marks their 20th. Still going strong and looking smashing! Congratulations. Of course this getaway would not be complete without a pilgrimage to Fluevog shoe store. Seriously, Fluevog should give these two some freebies or at least a major discount. They are unwavering fans of their products and their biggest promoters. You have to check out Sheila’s style blog ephemera if you haven’t already. Her wardrobe dazzles, as you can imagine from what she’s wearing here. See those boots? Wool. And they blend seamlessly with her tights. And tangerine leather shorts? Love! Soon she’ll post on her seasonal winter/spring wardrobe switcharoo. Don’t miss it. Logan writes Creative Maelstrom, where he unleashes his insane wit and intelligence reviewing CDs and concerts. I also like to think of his blog as a Cole’s Notes for the musically uniformed for frantic cramming before parties so you don’t feel like a social pariah. Heh. Truly, he is a gifted writer. I have featured Sheila and Logan many times: here, here, here, and here. We also made a 40sec video when they were in town. You can view it here. I think it’s hilarious but I’m biased. Heh. Get ready – Eco Fashion Week is coming! It’s the time again – Eco Fashion Week is back for its 12th season, March 31 to April 2, due to the amazing efforts of the event’s dynamic founder and organizer Myriam Laroche and her indefatigable team. I had the privilege of attending the press preview for this year’s event earlier this month at the Fairmont Waterfront Hotel. The event kicks off on March 31 with its signature open dialogue series, Collective Conversation Vancouver, which is a day of learning more about how far we’ve come and how far we have to go towards sustainable textile use and re-use. The day’s keynote speaker, Lululemon’s VP of global sustainability, will be followed by three panel sessions featuring fashion and retail industry leaders and stakeholders as speakers. Of course you can also expect a host of exciting new and familiar designers showcasing their latest original designs during Designer Showcases on the evening of April 1. And one of my favourite events, the Chic Sheets Bed Linen Challenge, will take place on the evening of March 31. Eight students from LaSalle College Vancouver have each been given four end-of-life sheets donated by Fairmont Waterfront and three weeks to resurrect them into runway fashion statements based on the theme of Canada’s 150th Anniversary. I saw some of their sketches at the preview – such talent. The following are some of the faces I saw at this year’s press preview. Below: Colleen Tsoukalas, writer/photographer of the blog Clothes Line Finds, co-run with her daughter Anthea. 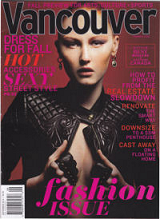 A familiar face at Vancouver fashion events. I wish I got a better shot of her shoes. Love those layers, textures, and colours. Below: Carolyn Bruce, designer of jaw-dropping steam-punk-inspired jewellery. Feast your eyes on her work here. Of course that’s one of her artworks around her neck. She has shown her collections in many fashion shows in the Vancouver area, including VALT 2016, captured on video here – and she look so innocent! Below: The women in red – knockouts! Left, Dianna Drahanchuk, President of SMOC (Society for the Museum of Original Costume) and award-winning fashion designer. Right, Robin Hemmingsen, President of LaSalle College Vancouver. Robin gave such a wonderful speech at this event, full of passion and dedication to EFW, her students, and her institution. So refreshing! Below: I didn’t get his name but he is one of the hardworking men behind the scenes in Myriam’s team helping to make EFW a success. I asked him if he often gets compared to the royals. He said Yes, sigh. Below: Designs from last year’s Chic Sheets Challenge displayed alongside the escalators at Fairmont Waterfront. Below: Random crowd shot. Why not? Below: Dianna again with unknown woman wearing a dynamite outfit. Eyes lock on. That’s all. Maybe I’ll see you at Eco Fashion Week. All the events take place at Fairmont Waterfront. Tickets and more information are available at the Eco Fashion Week website here. Who wouldn’t want these women as friends? Left is Sue from around Vancouver and right is Suzanne from the Toronto area, and I met up with them when Suzanne recently came to town. They are both style bloggers – what a surprise. Sue made that dotted coat and even custom-made the buttons (I regret that I didn’t get the buttons in this shot). What a great colour combination with that coral top and checked blue blouse. And those puddle-hoppers – priceless. Suzanne’s maxi coat is vintage, of course. I love how the patterns of her coat, umbrella, and scarf play so well off each other. Suzanne was on the blog before here, and so was Sue, here. Sue’s blog is called A Colourful Canvas, and she says: “Mostly I just sew stuff and then pose awkwardly in photos around Metro Vancouver. With a sense of humour.” Don’t let her lightness fool you – she is a highly respected sewist around the world and a talented artist. At Suzanne Carillo‘s self-named blog, she says: “I’m vintage obsessed, live and breathe art, and cater to the demands of a pug named Zoë.” Suzanne has two Etsy stores, one for her graphics-themed artworks and custom jewellery here and one called VintageBySuzanne for unique vintage clothing. Suzanne has a dedicated fan base addicted to her humour and style. Oh, the fun we had.